HE knows why you’re asking. He already understands as soon as the first two words of the sentence introduce the topic. And he doesn’t take it personally, your curiosity or anyone else’s. If you want to know how Ryan Mango (63 kg, Army/WCAP) views losses that he has endured, some more high-profile than others, some more jaw-droppingly frustrating than others, he’ll be happy to oblige. At its core, the subject is complimentary. You’re only asking because of what you’ve witnessed all the other times, which is layer upon layer of indisputable if not unrivaled talent fleshed out in a sport that absolutely needs more competitors just like him. 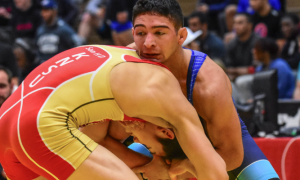 Yes, it’s true: Greco-Roman wrestling in the United States needs Ryan Mango more than he needs it, at least for now. Not that the 26-year-old doesn’t live to compete, because he does. 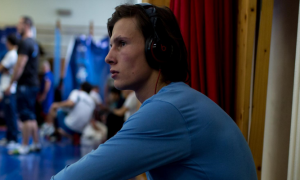 Not that he doesn’t devote his life to becoming a World and Olympic Champion, because that is all he thinks about. But in a climate where excitement trumps victory, Mango is one of a precious few who can deliver both. He knows you know this; that’s why he is willing to provide a walkthrough of how he used to think, how he used to approach competition. Plus, asking Mango the question gives him an opportunity to share the key he has discovered that will unlock the continual greatness typically reserved for immortals. That key, as it were, is consistency. Although, this revelation didn’t just magically present itself one day. The relative struggles he encountered aided in its unmasking. Virtually from the beginning, Mango was ticketed for Greco stardom. A three-time Missouri state champion in high school and a two-time All-American at Stanford, Mango also came to the party sporting Fargo National titles in both international styles from both major age groups. Combine (or compound) all of that with the fact his older brother Spenser had made two Olympic and six World Teams while firmly grasping the reigns as the face of the US program, and it’s easy to see why perception was what it was (and still is). But this isn’t a shadow game and it’s not about following footsteps. The younger Mango may have taken on the same occupation, but he has approached the trade in a very different way. There is traceability, because sure, DNA matters. Get past that just a little and you notice the contrasts. Whereas Spenser brandished gifts which were dynamic and unique and wonderful, he was more of chugging train that used the iron of the track to mow down opposition. Ryan, certainly for the first few years of his Senior career, could best be described as brilliantly volatile. There were not and are not a lot of dull moments. With a physical composition almost akin to a tightly-wound spring, Ryan could erupt in offensive bursts that either won him matches with shocking efficiency — or lost him bouts in the most confounding fashion imaginable. The up-and-down nature of his competitive endeavors has certainly seen more ups, just not often enough to where you would always assume a Ryan Mango triumph, this despite the hyper-kinetic ability and envious intelligence he operates with on a daily basis. The tide is finally turning. 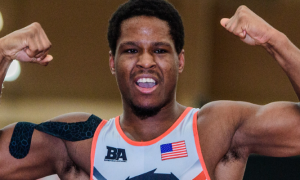 After a 2017-17 campaign that ended with a head-scratching defeat at the hands of a then-resurgent Max Nowry (Army/WCAP) in the third-place/National Team match at last April’s World Team Trials, Mango has morphed into one of the country’s most reliable performers. It started with a silver at the Dave Schultz Memorial in November and picked up a touch more steam a few months later with a win in the special USA/Serbia dual meet. Then there was Bulgaria and the Nikola Petrov Cup. It was a 1-1 showing that didn’t yield Mango a medal, but as you will come to find out, that’s the least-important detail from the trip. Most recently, Mango earned his first US Senior National title and a week hence, his first Pan Ams gold. So check this out for a second: in 2018 alone, Mango’s stat line is video-game lopsided — his record stands at 11-1 and has outscored vanquished opponents 100-13 with eight tech falls and two pins. For an athlete eyeballing consistency as the missing piece separating him from World-level achievement, it doesn’t get a whole lot more consistent, or dominant, than that. You don’t even bother bringing this ledger up to Mango in conversation. There is a mutual recognition that these glittering stats, these immensely impressive victories, are to be forgotten about in favor of a bigger picture. 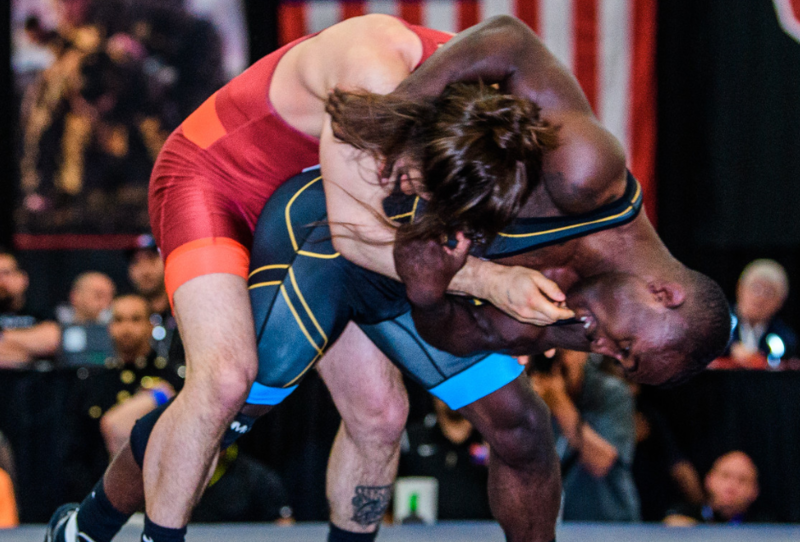 What really matters to Mango — and every other elite Greco-Roman athlete in America — is what happens next month in Tulsa, Oklahoma. It is there at the 2018 US World Team Trials where Mango will attempt to take the most important of steps. And should he emerge to represent the United States at the World Championships in October, you won’t be permitted to dwell on how it happened, regardless of how unforgettable his adventures in Tulsa may have been. You’ll still ask — oh, of course — just don’t expect a recitation of match sequences or in-the-moment feelings. He will have moved on by then, and thus much more inclined to discuss the stability in his game that had eluded his career for far too long. 5PM: You’ve been at 63 kilos since the new weight classes were introduced this year, counting the Dave Schultz Memorial in November. When 2020 rolls around, are you 60 kilos? Or is 67 on the table potentially given the weigh-in procedures? Ryan Mango: Oh yeah, I’ll be 60 for the Olympic year, for sure. I’m just going 63 because it’s a more comfortable weight for me right now. In the next year, I’m still unsure as to whether I’m going to go down to 60 and try it out, or if I will stay at 63 until the actual Olympic year. But definitely, for the Olympic year I’ll be down at 60. 5PM: Have the same-day weigh-ins been a challenge for you at all so far? RM: I actually think they’ve been beneficial for me. Guys who have wrestled in a collegiate environment, we’re used to a same-day weigh-in. It’s a little bit more familiar for us, so I have actually benefited from that, knowing how to cut my weight, what I need to feel like, and what I need to put back in during those two hours, as opposed to some of these other guys who have strictly done Greco or didn’t really have a very extensive college career. I think it has been a help and I’ve been embracing it. 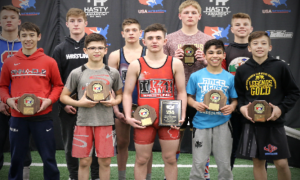 5PM: This question was requested of me to ask: understanding your age-group background that included Fargo titles at both Cadet and Junior in both styles and what kind of Greco prospect you always were, was going to Stanford an educational decision more than a wrestling one? RM: I wouldn’t say so much an educational decision as opposed to a wrestling one. I’d say that I knew there were compromises. The program was still building at Stanford, obviously. That was an environment I was going to have to embrace. It wasn’t fully established yet, it was still building. But for me, I wanted to be that person to step in, that “trailblazer” we’ll call it, to try to do this. To try and figure out that tough educational aspect of it, as well as the wrestling aspect. That’s kind of how I approached it, and it is kind of how I approached high school, as well. Our team wasn’t very good when I first got there. But we developed as a team and I loved being part of that environment. It was something that, again, was familiar to me, going to a team that wasn’t strong but helping build that team and being that guy. I think that was more of the decision that I made versus it being strictly scholastic or wrestling. 5PM: When you’re in college and you’re going through the college grind — all those matches, all the weigh-ins, the practices — was there ever a doubt as to what you were going to do, which direction you would go, following graduation? RM: No, there was never a doubt. I mean, it was no secret that I loved Greco. I feel like in college, I had little spurts. I would try to do Greco in the summers here and there, there was the World Team Trials and stuff like that. In 2013, I took a silver at the Trials at 60 (kilograms), so Greco was always the plan. I don’t think the grind of the college season or anything like that deterred me from what I already had in my mind. 5PM: There is something that I’ve noticed about you for several years. Almost every time I watch you compete, you tend to not have your mouth open. The way it comes out in pictures, it’s like you have these ultra-casual expressions on your face. Everybody else is grimacing and you look like you’re sitting in a barber chair. Is that indicative of, say, your personality, the way you approach competition? Have you noticed what I’m talking about? Yeah, I think it’s all part of preparation and I practice stuff like that. As far as my facial expressions, I’m trying to have fun out there, so you’ll see me before my matches a lot of times listening to music and maybe dancing a little bit. It all plays a part in feeling comfortable. So, the more I do that, the more successful I think I’ll be because everything is just routine. In college, we trained quite a bit on not showing signs — that’s what the coaches called them, “signs”. Everyday in practice, we were told to breathe out of our noses, that it would help us catch our breath faster, plus it won’t give your opponent an excuse to come after you or smell the blood. That is something I’ve been practicing for a long time and now it has become natural. It’s funny to hear you bring it up because I haven’t thought about it in a while, since it’s just natural to me now. But I definitely practice that, it’s not something that just came to me. It is something I practice that now helps me perform every time I step out there. I just take it one match at a time and try to be comfortable and relaxed out there. 5PM: People have said this to me both personally and on the record, how they are very surprised any time you drop a match. It’s like if Ryan Mango loses a match, they don’t understand how or why that happens most of the time just because of the boundless talent you often exhibit. And I agree, I’ve wondered how and why, too. Do you feel the same frustration, or even confusion when you’ve lost matches you’d probably love to have back? Do you see what others do from the outside? RM: I definitely see it and that’s part of my frustrations as a wrestler. Obviously, every wrestler wants to win all of the time and I know that’s not going to happen. But at the same time, it has taken me awhile to find that consistency. That is something I try to emulate or appreciate about my brother’s career, which is consistency. Every single time he went out there, it was the same thing. You knew what you were going to get. It was the same pace, so if he lost, you knew somebody really beat him. Whereas so far in my career, I’ve had some times when I have lost where it’s like, Oh, I can beat that guy. There have been plenty of times where I’ve lost and knew that I could beat the guy. I knew I had the skills; I just didn’t have the consistency to go there every tournament and turn it on. That is something I think I am finding now, that consistency, and it is something I’m hoping to continue to grow. I think it’s the biggest aspect of my wrestling right now that needs to click, and is starting to click, before I can approach that World/Olympic medal-level. As of late, I have been feeling really good and I have my routine down, so hopefully things are coming to. But yes, it has taken me a while to develop it and I’ve definitely thought about that in the past. 5PM: Is this something all of the Army lightweight guys, the “Ninja Squad”, have discussed among yourselves? This mentality, this direction, approach? Is it coached up? How does it work? RM: I mean, I think that it has always been a culture in WCAP. You know, the light guys stick together — and the whole team, don’t get me wrong. But specifically, the light guys, it’s the culture, they stick together. I think here lately, honestly, it really started to click when we went to Bulgaria for that training camp. There was a ton of light guys. Most of the guys on the trip were light guys from the Army. There was a ton of partners (in Bulgaria), so it was the first time we were really able to switch partners, wrestle other people, and not be wrestling each other. When we were going back after practices and stuff, we were critiquing each other, giving each other pointers, watching all the matches, and so on. It was really, really hitting home that we were out to help each other and build a community within the lightweights at WCAP, that everyone was out there for each other’s best interests. I think from Bulgaria, that sparked something brand new and we just carried it over to the Open and the Pan Ams with our light guys being pretty successful in those two tournaments. It is definitely something that is growing, the camaraderie between the light guys. And it is something that is beneficial, because now when we go out to practice — it’s not so much that we are trying to help each other, which we are — but also, we are willing to go hard against each other because we know that is helping the other person as well as yourself. I think that all around, there is a new environment in our room where the light guys are just pushing each other to the limit because we all want to help one another get better, especially now with the non-Olympic weights these next few years. It’s so spread out and we all have opportunities to make the (World) Team. We can potentially place WCAP in the first four weights on the Team, so that’s something that is fueling us and something that has been nice. 5PM: The way you’re saying it, the Bulgaria trip seems to have come at a clutch time of the season. When you’re getting ready for a long camp like that, a multi-week one at that, are there specific goals involved you want to reach in terms of productivity or technique? RM: We definitely had goals, there were things we worked on right before Bulgaria, things that we wanted to carry over into the Trials, basically. Things that we worked on in our room for the past month, month-and-a-half that we wanted to carry over to the Trials that were going to be our game plans, our go-to’s, and what we were going to do when we stepped out on the mat. When we went to Bulgaria we got a chance to try it, and to be honest, the first week sucked. We were all getting crushed. But — that helped us develop those game plans individually wrestling obvious top-class opponents. There were 15 or 20 training partners in there from 55 to 67 (kilos) alone. Being able to wrestle those guys everyday for that long? The first week, like I said, it went bad. But we still had two more weeks left and we were able to develop our style so when the US Open came, we were used to wrestling foreigners and pushing the pace. When we got back to the US, we just cruised along because we had fine-tuned that game plan. We knew what we wanted to do when we stepped out on the mat. We were fine-tuning all of that so by the time we returned home from Bulgaria and went to the Open, things were clicking for us. Honestly, Bulgaria fell at the right time. We were able to fine-tune a little more, we got our conditioning up, and then got ready for the US Open. 5PM: The US Open was obviously a big tournament for you and in a couple of different respects. I understand it’s only Step 1, but was it as important to you as I imagined it to be? You beat (Jesse) Thielke in the semifinal and then got past Sammy Jones in the final. Did it feel like a relief to get your first Senior National title out of the way? Ryan Mango: It did. So I’ll answer this in two parts. The first is that immediately after the Open, I was relieved and satisfied. I got some payback for my brother and myself. The last time I was in position to make a World Team in 2013, Thielke beat me in the last 20 seconds of the third match. Not that it’s bad blood at all, it’s just one of those wins that slipped away that you wish you had back. And then you fast-forward to 2016 and my brother loses to Thielke and Thielke goes on to make the Team. So obviously wrestling him, I had a little bit of a chip on my shoulder going out there. It was satisfying getting that win and kind of starting to distance myself from the field. And that speaks to the rest of the tournament as far as the other guys I wrestled. Like I said, I feel like I am getting that consistency and distancing myself from the field. To the second part, it was satisfying, but to be honest, I’m not satisfied yet. The next morning after the US Open, I got up and ran three miles. I was talking to my girlfriend and I said, I’m not going to stop until I get a medal at the Worlds and the Olympics. This year it’s the Worlds. For me, it’s all an ongoing process. Bulgaria, Armed Forces, the US Opens, the Pan Ams — it’s all just an ongoing tournament or a test event. I am just trying to test myself, fine-tune things, and get ready to perform at the highest level at the World Championships. For me, it was nice to take a day or so and relax, enjoy the win. But to be honest, it’s over. That moment is over and I’m just looking forward to the challenges that are going to come in the future. 5PM: Similar to the Open, the Pan Ams was a blitzing performance. You had a fun match with the Marine German Diaz in there, but other than that one it was wall-to-wall dominance. 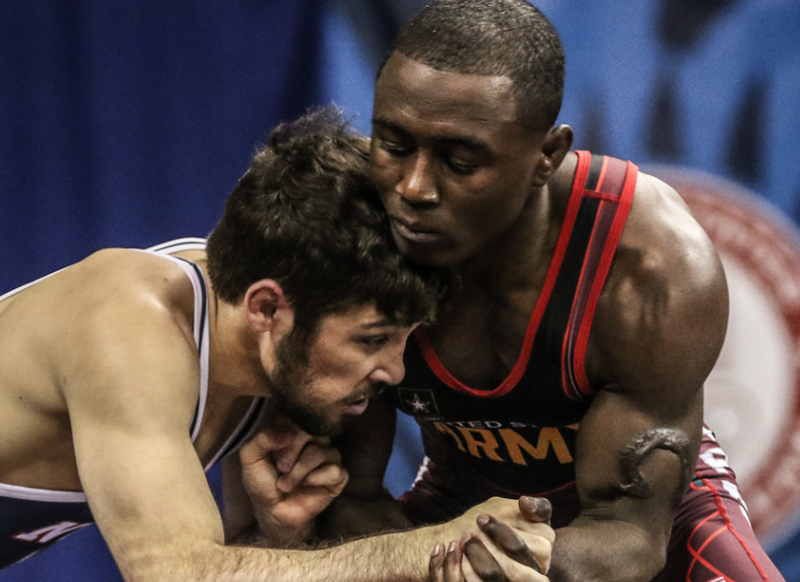 The Pan Ams is the kind of tournament I tend to think elite guys want to cross off their list. This was also a pretty fast turnaround, too. Even if everything is a test tournament for you right now, as you have said, was there something extra for you winning in Peru simply because last year’s Pan Ams ended in frustration and you dominated this time around? RM: Not so much, actually. The Pan Ams? I think I can answer that with a simple comment. Right before the tournament I was warming up and Herb House was in my corner, because the coaches were kind of split up. So Herb asked me, “How do you feel?” I’m like, I feel great, it feels just like Vegas. My preparation was good, the weight was good. Everything’s good. And he says, “Great, then there’s no reason why you shouldn’t win.” And then he told me how all of the guys who are in serious contention for a World or Olympic medal should crush everybody at Pan Ams. He just put that in my head. Going out there, I had that in my mind, because obviously, I think I am World/Olympic-medal caliber. So going out there, I just tried to do the same thing, take it one match at a time and dominate guys from start to finish, and that’s what wound up happening. It wasn’t something I was really, really excited about. Granted, yes, I was happy to win my first Pan Ams title. But like I said, it’s affirmation that the things I’m doing are working, the preparation is coming together, and I am starting to get consistent with my performance, and that is really what meant more to me than actually winning the title. 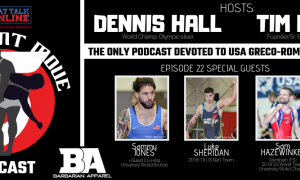 5PM: You’re a great guy to ask this because you had an excellent collegiate career and now you’re an Olympic-level Greco athlete: how has folkstyle worked for you, and how has it worked against you? RM: Okay, well I’ll go with how folkstyle worked for me first. Coming out of the chute when I was a brand-new wrestler, I actually started in the summer and it was the freestyle season. I was kind of learning with all three styles being thrown at me at the same time. I was just learning raw wrestling. 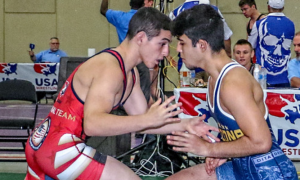 From the jump, I was more in-tune with freestyle and Greco, actually, and I think that because I practiced those styles in the offseason, it helped me develop my folkstyle abilities. Moving forward into Stanford, I think folkstyle is almost like a different kind of discipline, you know? Because, you’re weighing in every week, sometimes twice a week. You’re traveling, you have schoolwork, and I think in that way, folkstyle helped me stay disciplined, but wrestling-specific-disciplined. These are some of the things I feel a lot of Senior athletes may lack because you’ll see guys not come to practice, when obviously, during the folkstyle season if you don’t come to practice it’s because you are injured. You’re not hurt, you are injured, unless you are priming for a conference tournament or something like that and you really need the rest. But other than that during the season, if you’re not practicing, you’re not competing, and you are injured, not hurt. That is something a lot of Senior athletes miss when they don’t have that folkstyle experience. Even sometimes when you’re not feeling good, those are the days you don’t need to skip practice because you can pull the Oh-I’m-a-grown-man-and-I-can-control-how-I-train card. Those are the days you really need to get in there and push yourself because that is more than likely how you’re going to feel at one tournament or another where you need to perform. Learning how to push yourself when you really don’t want to — or when you’re really not feeling good or you’re not at 100% — is something that folkstyle has really helped me with. How has folkstyle worked against me? Obviously, it has been two, three, or four years of ups and downs for me trying to get rid of bad habits from folkstyle and turn those into good Greco habits. You know, like bending over at the waist, posting my arms…pretty much everything you do in folkstyle is a bad habit for Greco almost. That has been a challenge, breaking those bad habits and becoming a true Greco wrestler while still keeping my own style, which is what I think makes my wrestling exciting. Like scoring, high dives, and all that. I mean, there is some translation. There are also some things in the pummel that you just can’t do, so that has been a challenge for me as far as translating those bad habits from folstyle into good habits for my Greco career. 5PM: Last year during an episode of the podcast, Spenser was on and I brought you up since he was still in the middle of his first year coaching at WCAP and I wondered how that dynamic worked between he and you in the room. And he said, “Ryan is way better than I ever was.” Do you agree with his assessment? Ryan Mango: Hmmm. He says that to me all the time, actually. He says that I’m better than he was, but it’s when I decide to go out there and show everyone else that is when I’ll start winning. He tells me that all the time. I think the truth is that we are two different wrestlers. I think that my wrestling style is to go out there and score a lot of points. Sometimes I’ll lose based on match strategy. 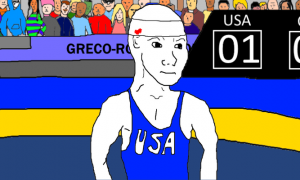 Like in 2013 in the (World Team Trials) finals, why didn’t I just close the match down and sit there and pummel for 20 more seconds? I got pushed out. Same thing against Max Nowry last year at the Trials. I was winning the match with ten seconds left, I get pushed out. Sometimes, what I think he (Spenser) lacks in physical ability he makes up for with match strategy. He’s a savvy wrestler. That is something I’ve been trying to build and I just lump it all into consistency, and that is something that comes along with being consistent. When you get down in a match, like against Diaz, having a game plan, sticking to the game plan. It’s okay, you’re going to give up points. But you’ve got to have the confidence you’re going to score way more points than you give up. So I think that is the answer, we’re just two different wrestlers. Maybe if you add up all of our attributes and we’re at the same level, or he’s a little higher than me or I’m a little higher than him, the key is that we both have different assets. And they are very different assets that we have. It’s about learning how to best use them. Follow Ryan Mango on Twitter and Instagram to keep up with his career and competitive schedule.